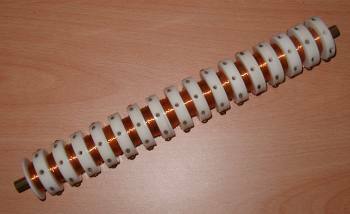 I built this coilgun in 1994 but never got round to completing it. The thought of wiring up all those opto sensors made me lose interest. It spent years lying around in my workshop until recently. It's getting a new lease of life and this time I'll finish it. Unfortunately at the time I built it I wasn't sure what I was doing from a theoretical standpoint so the physical design is less than optimal. 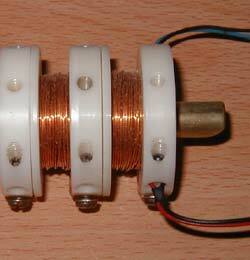 The accelerator is about 300mm long, made from brass, and is slotted to reduce eddy current losses. Originally the accelerator tube wasn't slotted, this was the first thing I changed after blowing the dust of it. I also wound off some of the wire from the coil formers, these were packed full of wire and made for a poor coil geometry, not to mention an inductive nightmare. 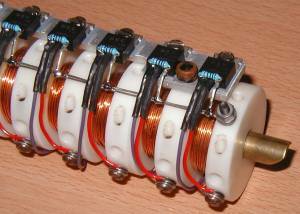 The images below show 2 of the 16 coil formers and the optical gate components. The formers are turned from Acetal engineering plastic. The infrared diode and phototransistor are mounted in a small plastic plug which fits into the former, they are locked in place with grub screws. I've finally finished the mounting and wiring of the mosfet switches. 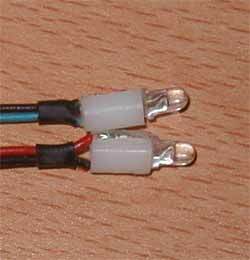 I'm using IFRZ44A mosfets mainly because I had lots of these lying around. Click on the images to get a high resolution version (hint: if you're using IE hold down shift when you click a link to spawn a new window). The MOSFETs are isolated from the aluminium mounting strip using thermal conduction pads (little rectangles of rubbery-plastic material). Commutating diodes are mounted underneath the coils.